Dimensions: 4" x 4" x 9"
Dimensions: 10" x 10" x 3"
Dimensions: 8" x 8" x 9"
Dimensions: 10" x 10" x 9"
Dimensions: 12" x 12" x 9"
Black Gift Boxes with Lids are perfect for beauty salons, boutiques & gift shops looking to send their products home in a sleek yet reliable gift box. Black Gift Boxes & Black Lids can also be used for personal and business gifting thanks to the high walls of each box. The silky Black color of the gift boxes and gift lids make them an ideal choice for organizing supplies at home, gift giving and more! 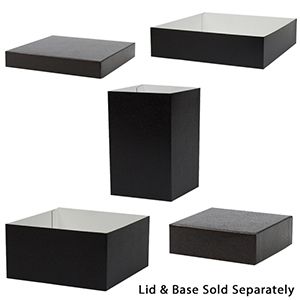 At American Retail Supply we offer the Black Gift Boxes in 10+ different base sizes, and 5+ Black lid sizes making them great for gifting and organizing small & large items alike. Each black gift box is fitted with high walls that will allow you to pack a wide range of itmems inside the box without fear of the box breaking or your items falling out. From beauty supplies to holiday gifts and more, these Black gift boxes and black lids are a perfect choice. At American Retail Supply we value the customer’s ability to customize their products. For this reason, all boxes & lids are sold separately, giving you the freedom to mix & match your Black Gift Boxes with gold, red, white or black lids. While Black Gift Boxes & Lids are a classic and elegant way to provide something extra for your customer, you can take it a step further with other decorative options. Personalize your Black Gift Box with bows,ribbon,tulle, wraphia & other accessories. Go the extra step and add tissue paper and gift wrap to every Gift Box! Although we offer a large variety of accessories, if you cannot find what you are looking for, we would love to help you customize any of these products so that they fit your store, gifts or home perfectly. At American Retail Supply we offer the Black Gift Boxes & Lids in a pack of 50 per case. All gift boxes and lids ship flat and are easy to assemble.